Learn how to play this archetype with our Togwaggle Druid Deck List Guide. We’re not sure who created the deck, but Dog credits someone else. Can you play this without twig floopn. Hakkar? I believe this deck is stronger with azalina and a flourist added to the list, just to be able to play the old togwaggle combo in case your opponent destroys your naturalizes with geist. Plus, with two win conditions you’re less vulnerable to demonic projects (if your hakkar gets transformed you play the azalina combo and if your azalina gets transformed you play the hakkar combo). I don’t get the absence of Azalina. Or this dosen’t matter on aggro matchups, when you cant fill opponents hand with cards and he gets togwaggle’s spell? Would the usual “Flourist instead of Twig” budget variation still work here ? This deck rocks!! Most fun I’ve had playing Tog Druid. On one match against Odd Mage, I lost the Twig to Harrison Jones. It didn’t matter. I was able to use one Naturalize to fill his hand, and play Togwaggle. It was basically over. Then, he silenced my Hakkar (because I couldn’t kill it right away), but it still didn’t matter. I was able to mill him down from 30 health in one turn. Pretty sure this isn’t Dog’s deck. I saw him on stream lose to this deck and he decided to try it for himself. Not sure who actually made the deck since I wasn’t paying attention to the person who used it. I just know that this deck didn’t come from him and he mentioned in stream that he wanted to know the person who made it to credit them. 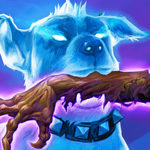 What happened was that Dog tried to make the deck from memory when he played it and then after a while someone sent him the actual deck list and it was exactly the same as LVGE. He said on stream that BGH and MCTech were good additions by LGVE.